1byone 60 Miles Range Omni-directional Amplified Outdoor Antenna for FM / VHF / UHF with SMD Circuit Technology, Anti-UV Coating, Waterproof and Super Compact. 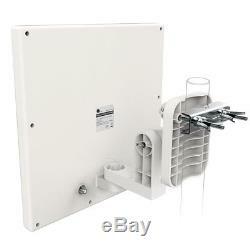 1byone Omni-directional Outdoor / Attic HDTV Antenna 1. 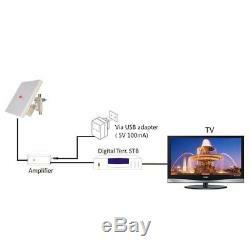 Receives free High Definition TV broadcast signals (such as ABC, CBS, NBC, Fox, The CW and PBS). Fast setup in 3 easy steps - Unwrap, Plug in and Scan channels. 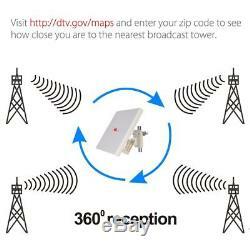 If you are facing issues like weak or intermittent signal, try moving the antenna to a different location or aiming it in the direction of the broadcast tower. It is best to place the antenna in line of sight with the TV tower(s) and avoid obstructions. Make sure to place the antenna in a location with strong signal and without obstructions between it and the broadcast tower(s). Do remember to do a channel scan every time you move the antenna. As with any antenna, you may find many variables contribute to your antenna's performance. 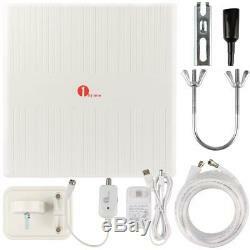 If your antenna is not working as expected, try one of the following: 1. Check the antenna is correctly connected to your HDTV or 3rd party HD receiver. Set the mode to Antenna or Air in the TV's setup menu and re-scan for channels. Antenna signal strength can vary depending on distance from the tower, terrain, and weather. If needed, reposition the antenna in a different location. Always re-scan for channels after moving the antenna. This is an amplified antenna; If a signal cannot be received with the external amplifier, remove the amplifier and try again. In some instances, the amplifier may cause self-oscillation, which may interfere with the signal. Product Dimensions: 12.3 x 12.1 x 4.9 inches. Item Weight: 3.65 pounds. 360° Omni-directional Reception - Receives signals from all directions. No need for huge outdoor antenna with remote control to change the direction for better reception, delivering full 1080p HD to any digital-ready TV. Detachable Amplifier Kit - Includes a high gain, low noise amplifier kit for improved reception strength! 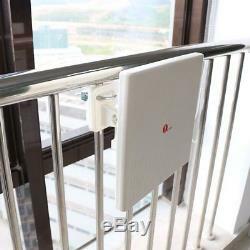 The reception ability and materials are far beyond Yagi antennas. Longer Cable, Easier Setup - Our included 20-foot coaxial cable makes it easy for you to place the antenna in the area with the best reception, and is especially useful for customers whose TV's are not near windows. New concept design - Its compact size reduces wind load, providing much better signal reliability on windy or rainy days. Anti-UV coating and waterproof / snowproof design allow shielding for minimum interference. Please Note: Over-the-air reception is dependent upon environmental factors, we cannot guarantee reception in all conditions. You're already purchasing the item. With our dynamic pricing model, our prices are always competitive. Our prices are some of the lowest that you will find on the internet. Rest assured that you're getting a good deal when purchasing with us. 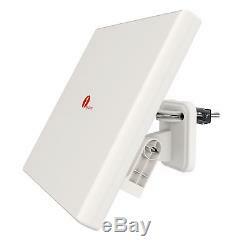 The item "1byone 60 Miles Range Omni-directional Amplified Outdoor Antenna for FM /" is in sale since Friday, August 10, 2018. This item is in the category "Consumer Electronics\TV, Video & Home Audio\TV, Video & Audio Accessories\TV & Video Accessories\Satellite Dishes". The seller is "nuttybeez" and is located in DeKalb, Illinois. This item can be shipped to United States.